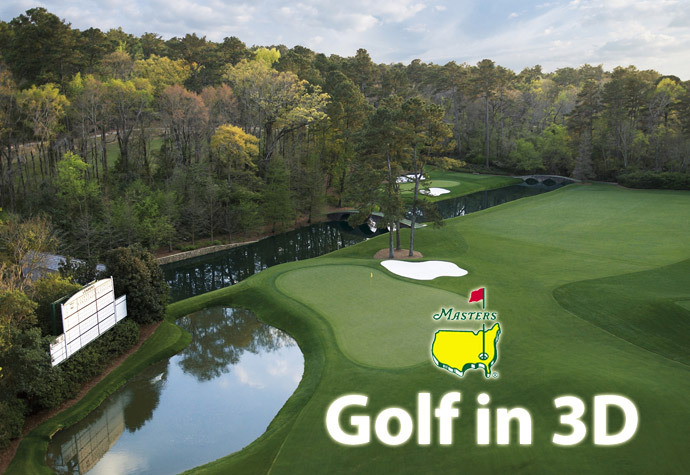 Last year’s Masters Golf Tournament has been broadcasted in 3D online and apparently they’ve decided to do it again this year, they’ve already started on 6th this month actually, but you still have the time to catch up until the last broadcast in Sunday. The video stream is in Windows Media format and the 3Dvideo is packed in Over/Under format, so you should be able to play it on a 3D-capable desktop PC or a 3D laptop directly, or even from a normal computer to a 3D HDTV if you have one. Wednesday 6 April 2011: 3:00 p.m. – 5:00 p.m.
Thursday 7 April 2011: 5:30 p.m. – 7:30 p.m.
Friday 8 April 2011: 5:30 p.m. – 7:30 p.m.
Saturday 9 April 2011: 5:00 p.m. – 7:00 p.m.
Sunday 10 April 2011: 5:00 p.m. – 7:00 p.m.
And although the golf may not be the best sport that everyone likes, at least outside of the US, it is still something that you can check out of sheer curiosity just to see how the 3D works with sports broadcasts. I know I’ll be doing just that as I’m not that big fan of Golf, but I can say that I’ve played some and that I’m not very bad at it actually, so with some more time and training… who knows.